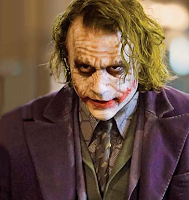 Cinema Critic: Batman: The Dark Knight...Or Should It Be, The Joker? Batman: The Dark Knight...Or Should It Be, The Joker? You get one amazing moment of the film, the Joker walking out of the building in a nurse's outfit while the building blows up: his face a series of glee, annoyance, disturbance, ennui, even fear at his own creation. As Ledger acts his way in front of a building blowing up, you realize you are being held captive by an actor's performance. We've had these moments - these visceral "ah hah!" moments of amazing cinema in movies recently: when the car is swept off the ground in James Bond as the plane takes off; as WALL-E discovers Eve's wonderfully perfect shape and purpose. But it's rare to have that moment as a mixture of imaginative old-fashioned explosives and amazing acting.